Our deli offers the best meats, cheeses & other salads to satisfy your needs. 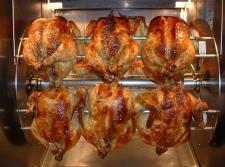 Hot Rotisserie Chickens cooked many times daily. We have the best sub sandwiches in town, made fresh to order. Our Roast Beef is baked in store fresh daily. Looking for a meat, cheese or produce tray for your next event? Ask one of our experts today - they can help you decide what to get and how much you will need.